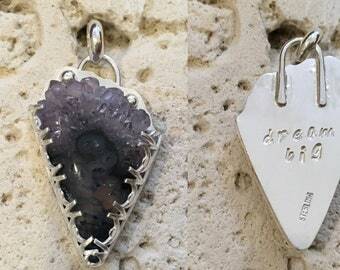 hand cut cabochon of rosetta stone, capped in sterling silver and made into a unisex pendant. It's easy to see why I call it "zig zag" from the wonderful pattern of the stone. The stone has wonderful colors of pale peach and brown and white. The pendant is just over 2 inches (50mm) long from the top of the bail to the point of the cabochon. This would look great on a black or brown cord or a silver chain. I do take custom orders so if you'd like something similar with a different stone or detail, you and I can design a piece together just for you. Local customers wanting pickup or other payment options should contact me for further instructions. Any of the stones for sale in my shop are also available for custom setting. Sterling silver modern jasper pendant necklace. 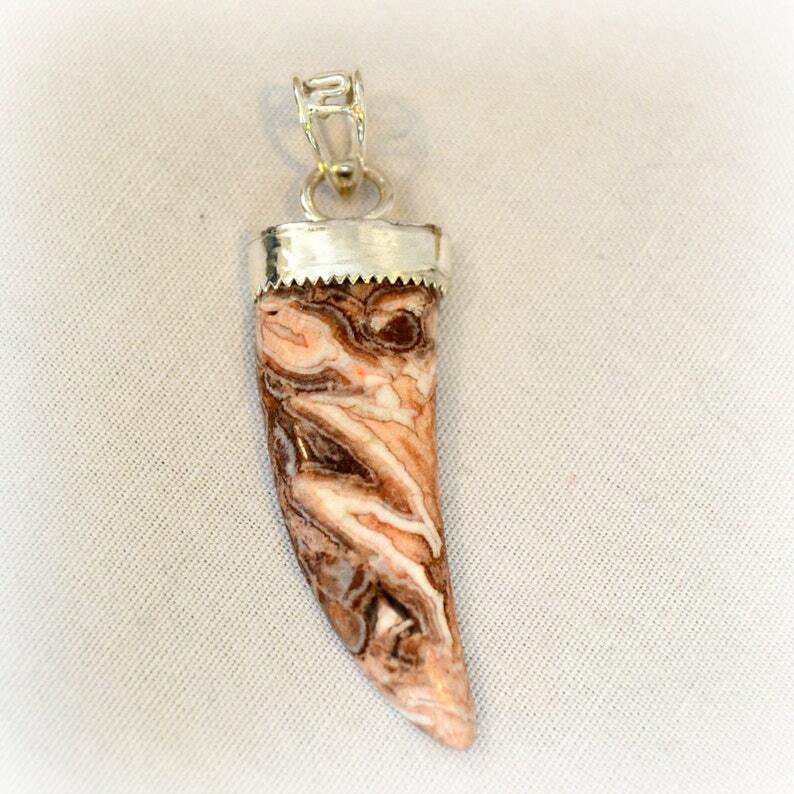 "Bullseye"
Ocean jasper and pink tourmaline sterling silver pendant. "spring garden"
Peanutwood and citrine artisan earrings. "sneaky snake"
Beautiful item. Exquisite stone in an interesting setting. Wonderful eye for design. Love the lucky frog. Couldn’t be happier. Orion Variscite and lucky frog pendant. Rosetta lace designer cabochon. handcut 37 x 18 x 5.4 J. Southwestern lizard and stone on stone necklace pendant.